I don’t think that the crucifixion was inevitable. I don’t think it necessarily had to go this way. God sent his Son to be incarnate and live as one of us. Jesus was sent to reconcile humanity with God, to repair the breech, to lead us back to unity with God, and to enable us to share in the hopes and dreams and desires of God for his vast creation. God doesn’t choose to play us like puppets, so there had to be some freedom and flexibility in the plan, so that God could adapt to the human element, to the ways that we might act or react or change the plan. That doesn’t mean that we had to end up killing him—but that’s what we did. I don’t think that the crucifixion was inevitable—but it was very likely, knowing who God is, and knowing who we are. We humans have an innate tendency to be selfish. We look after our own interests. Our tendency is to look out for number one, and to be suspicious of anyone or anything that threatens our power, our position, or our possessions. It’s a system that works. It’s not a system that is good, but it works because it is predictable and reliable. Jesus came to break this system. Jesus came to tell us about a more excellent way. And he didn’t just come to tell us with his mouth, but with his whole body and through everything that he did and the people he hung out with. He could have been part of the political system, he could have gotten in good with the religious system—but he didn’t. Instead he came to break the system. He came to challenge and question and confuse and confound and to beat up the scribes and the lawyers and the religious leaders with their own law because he knew it better than they did. He came, asking the hard questions about what justice, and mercy, and grace, and love really look like and act like and feel like. Jesus threatened the system and so the system fought back in the only way that it knows how. We didn’t have to end up killing him—but that’s what we did. Because, at the end of the day, that’s who we are. We make the selfish choices. We perpetuate systems that aren’t fair, but that work because just enough people get what they want, they can justify taking it away and keeping it away from others. We made the choice to kill the Lord of Life because that’s who we are. But—we call this day “Good” Friday because of the other person in the equation. God knows humanity. God knows humanity thoroughly. And even if the crucifixion wasn’t part of the original plan, God wasn’t done with us yet. Despite our pettiness, our fear, our cruelty. Despite humanity staying true to our worst instincts, God stayed true to his best nature. God kept on being God and that means bringing hope out of darkness, bringing freedom out of captivity, bringing redemption out of death. Even while we were yet sinners, Christ Jesus chose to die for us, and in so doing, turned our ultimate act of betrayal into a means for achieving the reunion that he came to accomplish. God loved us—and loves us—so deeply that our own attempts to ruin it were doomed to failure because there is nothing that you or I or anyone else can do that is bad enough to make God stop loving us. God’s capacity for love is greater than our capacity for sin. I don’t think the crucifixion was inevitable—but it was likely, and I suppose it’s not surprising knowing the way we are. Good Friday is the day that humanity failed. We failed because we closed our eyes and minds and hearts to God’s message of love and truth and peace. We failed because we thought the way to stop God from challenging us and challenging our systems was to kill. We failed because there is nothing that we can do to make God stop—to make God stop loving us and calling us back to him. Today is the day that we failed—but God wasn’t done with us yet. God isn’t done with us yet. This entry was posted in Church Year on April 19, 2019 by Derek A. Olsen. Rule o’er the people’s homes in love. Today is the Feast of Christ the King in the old Western Kalendar. 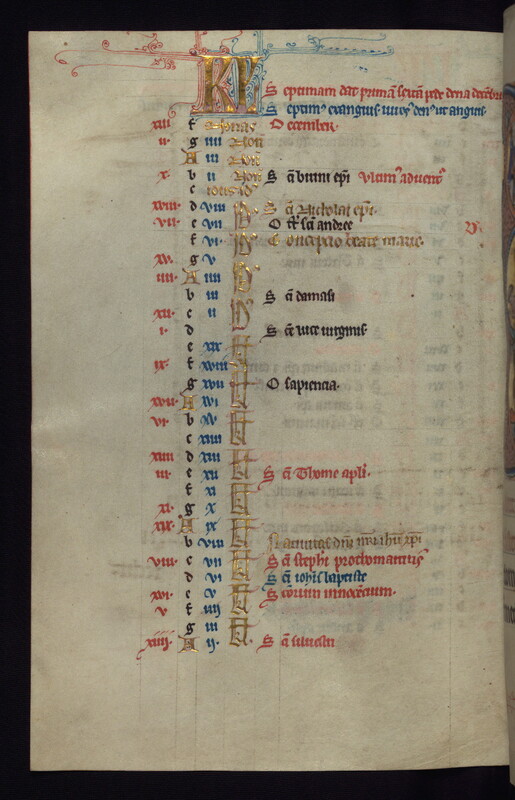 I relized this late and was scrambling this morning to insert propers into a database following the Old Kalendar so they would display correctly. As I typed and read through these texts, the more they spoke to me. I rose this morning to the news that there have now been three domestic terror attacks within the span of a couple of days fueled by ideological and racial hatred. The secular world can only shake its head and talk about intolerance and the partisan divide. Luckily, I’m a Christian so I have better language: this is evil, caused by sin. More specifically, it is sin empowered and emboldened by the loudest voice in the State. Ant. 1: This is the true Solomon, † whose Name is the pledge of peace to the whole world, * and the throne of whose kingdom God hath established for evermore. Now I get that there are some in the Episcopal church who find the language of royalty and kingship challenging. I have heard that this language of dominion can be a retrenchment of patriarchal thought. And yet I find it a comfort and aid this morning as I consider the news. I put my identity as a follower of Christ before my gender, my race, and—yes—even before my national origin. For me my Baptism is at the heart of my identity. Don’t get me wrong—I am proud to be an American (usually) and am proud to be the son of a veteran from a lineage of veterans. But the words of the Pledge, “and justice for all,” ring hollow when politicians flagrantly disregard them. At those moments, I remember that I am the subject of a Sovereign. Ant. 3: Behold the Man who is like to the sunrising, † whose Name is The Branch; * he will sit and rule upon his throne, and speak peace unto the nations. Political systems and movements that play upon racial hatred are anti-Christ. There is no other way to say it. So Jesus called them and said to them, “You know that among the Gentiles those whom they recognize as their rulers lord it over them, and their great ones are tyrants over them. But it is not so among you; but whoever wishes to become great among you must be your servant, and whoever wishes to be first among you must be slave of all. For the Son of Man came not to be served but to serve, and to give his life a ransom for many” (Mark 10:42-45). The proclamation of Christ as king gives us an alternative and superior political standard that challenges all earthly systems and regimes and powers. Sin and evil and death are put on notice. But we—we the people—have to follow the lead of our true leader. Chapter at None: For it pleased the Father that in him should all fulness dwell; and having made peace through the blood of his Cross, by him to reconcile all things unto himself, * whether they be things in earth, or things in heaven (Col 1:19). This entry was posted in Church Year, rant on October 28, 2018 by Derek A. Olsen. I hope everybody had a great Thanksgiving and a good start to Advent. I’ve got some posts in the works that are proceeding in fits and starts. Barring actual substance, then, here are some manuscript pictures! I’m at a loss concerning the bishop being celebrated on December 4th. 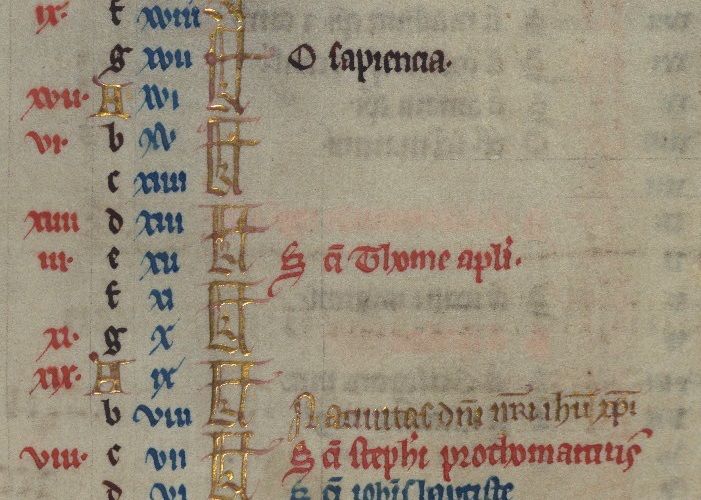 I’d expect St. Osmund or St. Barabara here ordinarily; I’ll have to poke into this one a bit more… I was initially trying to read “Ambrose” here and we do have the “A”, an abbreviated m/n (that’s the line over top the “a”), and a likely “b”, but nothing else fits. And it’s on the wrong day. 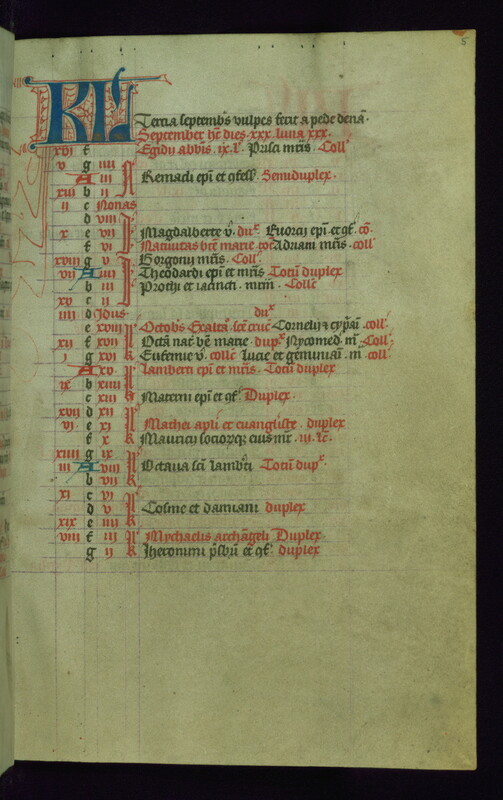 In any case, the note in red next to his name indicates that this is the last possible day for the first Sunday of Advent. Nicholas and the Conception of the BVM get gold lettering; these are major feasts—I’d expect nine lessons and special propers. The Octave of St. Andrew falls between them. 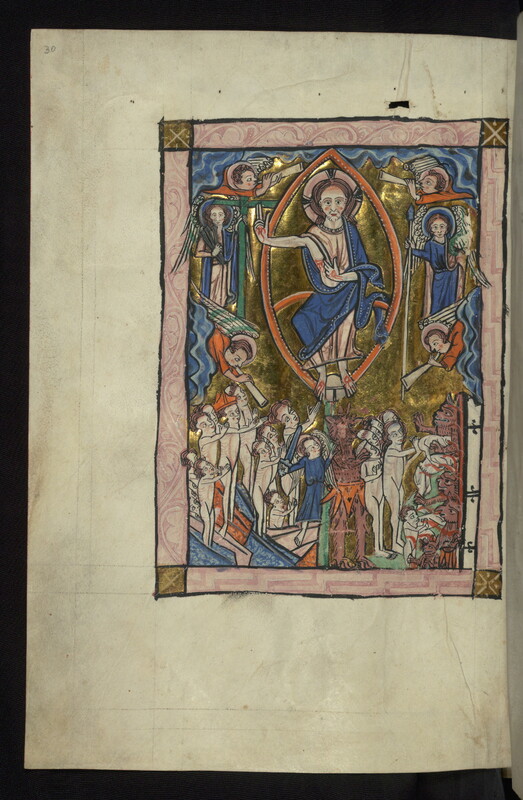 This entry was posted in Church Year, Medieval Stuff and tagged Carrow Psalter on December 1, 2015 by Derek A. Olsen. 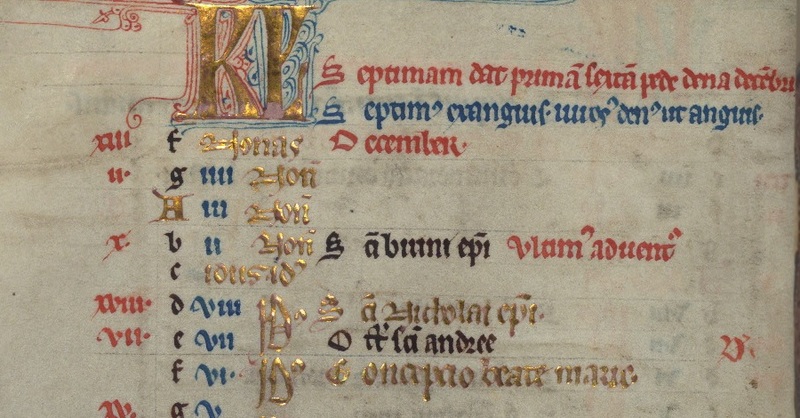 As many readers know, I’ve got two books in the pipeline right now, one on early medieval monastic Gospel interpretation at the final page proof stage, the other on the spirituality of the prayer book in the editing stage. Both of them deal with the liturgy and how it works; I was reminded of elements from both today. One of the strengths of the interlocking liturgical cycles is the opportunity for “pregnant juxtaposition.” That is, through the regular operation of liturgical mechanics, items and elements are put into relationship with one another. The ones praying have an opportunity to see connenctions between them and, in this process of discovery, to gain new insights into the character of the faith and the identity of the Triune Deity behind it all. The regular monthly psalm cycle gave us Pss 90, 91, and 92 this morning. As I mentioned in my previous post, Ps 90 is and will continue to be a focal point for my reflections on intentionality and simplification this Lent; its appearance this morning was completely seredipitous. Likewise, Ps 91 is deeply connected with Lent for me. In the medieval cycle, the Minor Propers for Lent I were taken from Ps 91 given its appearance in the Gospel appointed for that feast, Matthew’s narrative of Jesus being tempted by Satan. Medieval monastic interpreters—Aelfric among them—argued that Satan was misinterpreting the psalm in applying it to Jesus. Rather, it applies to those of us struggling towards righteousness. God will allow us to be tempted and tried, but also lends us protection and strength throughout the process. Lines from this psalm will recur throughout the monastic Office for the entirety of Lent, reminding those paticipating in the liturgical cycles of God’s faithfulness in trial and testing. The second component of the Ash Wednesday service that focuses us is the imposition of the ashes themselves. This is a liturgical moment of great power—and should be allowed to speak for itself without piling up a bunch of words around it. Some of my most poignant and important memories of Lent are memories from this point in this service. I remember my first Ash Wednesday as a parent when I carried my infant daughter to the rail and saw the priest put the ashes on her forehead. The contrast, the paradox, between her youth and the mark of mortality affected me deeply. Some may think this inappropriate—but I recall how many churchyards through which I have wandered, looking at gravestones, and seeing markers for children (and often their mothers) younger than her. The reality of mortality offends our sensibilities—but to deny plays into our fantasies. Alternatively, I remember one year when I assisted in the chancel, imposing ashes. As I moved around the rail, I found myself at three figures—in the center was an elder of the congregation, his eyes closed, face to the sky, arms outstretched, gripping the hands of his wife on one side, his best friend on the other. For the previous nine months I had been visiting him weekly as he wrestled with an aggressive cancer that had turned terminal. We all knew this Ash Wednesday would be his last. For him, this moment was a solemn embrace of sister Death within the company of the church, the whole Body of Christ gathered around him. Here, though, lies one of the brutal truths of Ash Wednesday: he was not closer to death than anyone else in the room. All of us are but a breath, a heartbeat, a moment away from death. The difference between him and us was his awareness of his situation. He knew and chose to face the truth of his mortality, a truth about which most of us would prefer to remain blissfully unaware. From this point in the service we move to the third component, Psalm 51, the greatest of the penitential psalms. In these words, we are given the example of what full disclosure before God looks like. The psalmist is under no illusions about his interior state; there is an honesty here that we may find uncomfortable, but which speaks directly to the presence, reality, and power of sin in our lives. To my mind, the prayer book gives us this psalm at the beginning of the season. We receive it as a model of penitent prayer. We may not feel every bit of what the psalmist says, but it gives us direction and guidance for our own deep self-examination to which we are called. And, as we pray it and gaze within ourselves, we may indeed find ourselves drawing closer to his perspective than we might have first thought! Jesus said, ‘The first commandment is this: Hear, O Israel: The Lord our God is the only Lord. Love the Lord your God with all your heart, with all your soul, with all your mind, and with all your strength. The second is this: Love your neighbor as yourself. There is no commandment greater than these.’ Mark 12-19-31 (BCP, p. 351). By putting this section of Scripture at the beginning of our Eucharists, the architects of the early prayer books were giving this passage a special place in our understanding of what God requires of us and what righteousness looks like: loving God, loving neighbor. This is us as God wants us to be. We have not loved you[, God,] with our whole heart, and mind, and strength. We have not loved our neighbors as ourselves. We have not forgiven others, as we have been forgiven. Have mercy on us Lord (BCP, p. 267). A lot of us are uncomfortable talking about sin, sometimes due to coming from traditions that seem to over-emphasize it, but here the prayer book is laying out clearly its definition of sin. Sin is the failure to love. Where we have failed to love—in thought, word, and deed—we have departed from God’s intention for us and for his whole creation. The rest of the litany goes on to identify and help us recognize concrete ways that we have done this. Having set out the main thesis up front, we are offered further examples of failures to love in which we may find ourselves. Again, the purpose here is not self-flagellation, but honesty about who and what we are. The litany confronts us with the reality that we fail to be the people God created us to be and gently recalls us to that high vocation, reminding us of that second call of the Baptismal Covenant: “Will you persevere in resisting evil, and, whenever you fall into sin, repent and return to the Lord?” (BCP, p. 304). In these ways, Ash Wednesday sets the proper tone for the rest of the season. It’s not a period of punishment, but a sober, honest opportunity to look at ourselves as we are: frail, fallible, and mortal. We need God’s grace. We need God’s love. And we need to live that grace and love for the rest of the world to see. Lent is our time to look into ourselves, our communities and to pray for the strength, the courage and the assistance to live our Baptism like we mean it. In a work such as this, I would certainly be remiss if I did not offer the reminder that Lent is a perfect time to recommit ourselves to the regular practices of the faith—including the praying of the Office and attendance at Eucharist. These are not great ascetic works—they’re actually fairly easy—but are more useful in the long run than attempts at greater feats of penitence. As we move more towards the habitual recollection of God, we are also recollecting ourselves—who we are in the face of the God who created us and loves us (no matter what!). [i] You may wonder where “love of neighbor” shows up in this list: it’s tucked into the call to “prayer, fasting, and self-denial” (BCP, p. 265). Fasting is not just about going without for as some sort of holy diet. The intention is that you reduce the amount of food that you eat so that these resources can be given to those who do not have it; we abstain from food so that we can take the food or money we would have spent of food and offer it to charity. Furthermore, in the time that we save from not eating, we engage in prayer for ourselves and for the world, loving our neighbors in the passive act of intercession as well as in the active act of giving alms. This entry was posted in Church Year, Liturgy and tagged Prayer Book Spirituality Project on February 18, 2015 by Derek A. Olsen. One of the things that I talked about in my dissertation that I’m revisiting as I frame it into a book is the principle of liturgical juxtaposition. 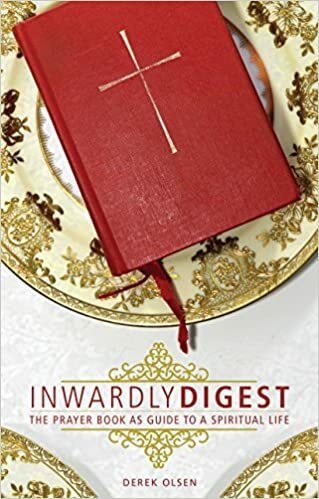 That is, one of the ways the liturgy functions is to draw Scripture together—literally placing passages one next to the other—sometimes purposefully, other times accidentally as different cycles draw different texts together, then leaving the participant to tease out connections and relationships between them. Sometimes these come only at a great stretch as we see in some tortured allegories of the liturgy. At other times, they flow effortlessly, naturally, and powerfully. That was my experience at Morning Prayer today. The Passion from yesterday still ringing in my ears, reading Psalm 72 (on the monthly cycle), a psalm of royal triumph, juxtaposed with the Monday in Holy Week antiphon: “The Lord was brought as a lamb to the slaughter, and He opened not His mouth” neatly captured the contrast that will animate the rest of the coming week. This entry was posted in Church Year, Liturgy on April 14, 2014 by Derek A. Olsen.